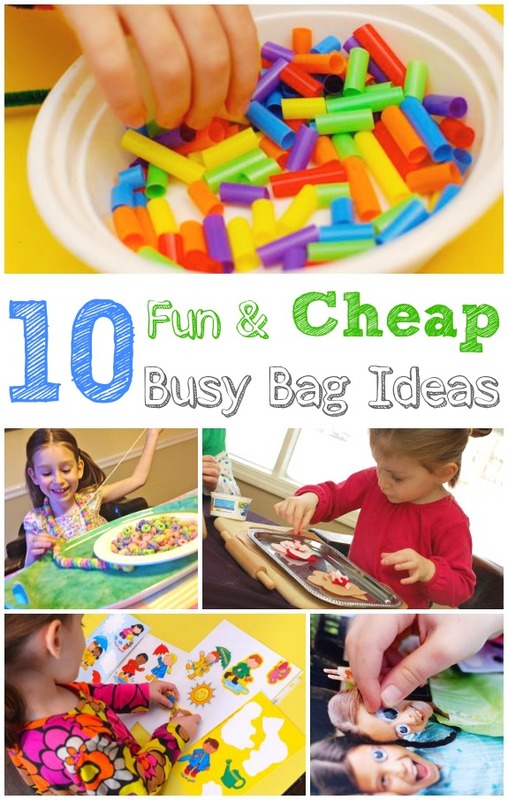 These busy bag ideas are a great way keep kids entertained, especially when you need a simple boredom buster with minimal set up required. Having busy bags pre-filled and ready to go is an easy way to organize materials for spontaneous play time fun whenever inspiration strikes! Tip: For easy storage, use large pencil bags from the dollar store and keep them in a bin. Since the pencil bags come in several different colors, you could have them color coded by child or interest. You probably have many of the materials to make these busy bags already on-hand. Most of these materials can also easily be found at your local dollar store! 1. Toothpicks and marshmallows (or gum drops) to make edible sculptures. 3. Window clings and page protectors for the kids to make their own play scenes. 4. Pipe cleaners and beads to make bracelets. No beads?? Cut up straws work well for this too. 5. String and colored cereal to make necklaces. 6. String and color-coding labels (or sticky notes) to make a festive garland. 7. Old magazines and googly eyes for some silly picture fun! 8. Felt shapes and cookie cutters for some pretend baking! 9. Yarn and sandpaper to make “mess free” drawings. 10. Clear contact paper and tissue paper to make sun catchers. Want more fun craft ideas and activities?? Sign up for our weekly-ish newsletter (it’s free!) 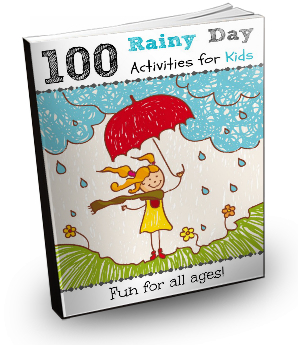 and after signing up, you’ll be sent a link to a free printable list of 100 Rainy Day Activities for Kids — exclusively for our lovely newsletter subscribers! To sign up, click here.